I am working with an Adafruit Feather 32u4 FONA board. 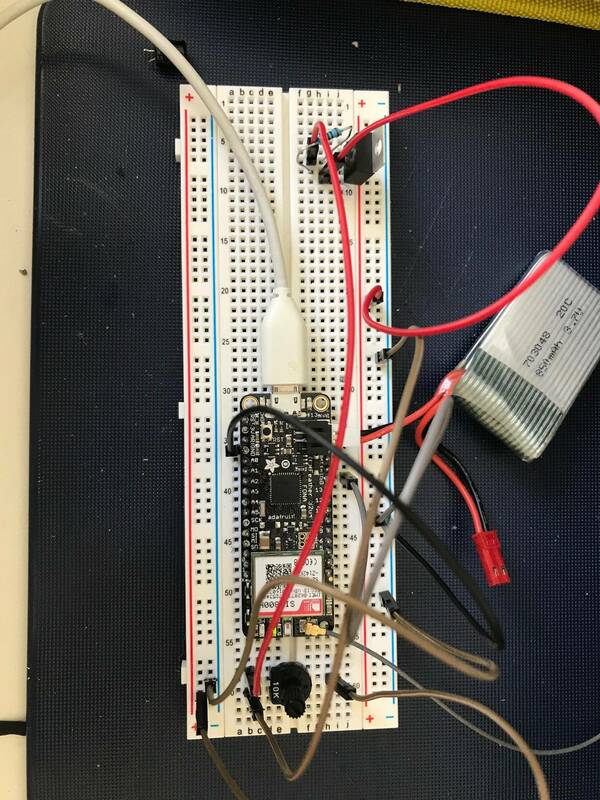 I want to connect a GPS module I have worked with before (3.3V required) but am not having much luck. I have studied the pinout of the board and have tried the 3.3V pin but it is far too erratic in nature and cannot sufficiently power the module. There is a pin called USB which supplies 5.0V from the pin if a micro USB cable is connected. I have used an LM317 and a potentiometer to make a voltage regulator circuit to convert the 5.0V from the USB pin to the 3.3V I need for the GPS module. This works, as I have measured 3.3V successfully using a multimeter. The problem is that when I connect the VCC and GND pins of the GPS module to the 3.3V regulated output, the module still doesn't get any power. I measured a significant drop to around 0.89V across GND and VCC after I connect the module. What could be causing this strange behavior? The bottom left rail is what I am trying to use to power the GPS module, before I connect it I get 3.3V as mentioned earlier, which is the required level. According to the datasheet the LM317 has a minimum Vin to Vout of 3v so you'd only be able to get 2v out of it if you put 5v in. I'd recommend using either an AMS1117 3.3 or one of the cheap modules based on that chip that has an LED and capacitors on board. They definitely deliver 3.3v from 5v in. A while has passed since I asked this question but in a bid to resolve it, I used my Buck regulator as suggested and this solved the problem. Not the answer you're looking for? Browse other questions tagged voltage-level voltage convert or ask your own question. Do I use 3,3V or 5V, when device supports both?